When I was younger my mom always insisted my siblings and I write thank you notes for gifts. She'd take us to the store to pick out note cards and we'd spend the afternoon sitting at the kitchen table writing them. Now 20 years later I still always make a point to write thank you notes. Writing thank you notes not only show good manners, but for me are fun. 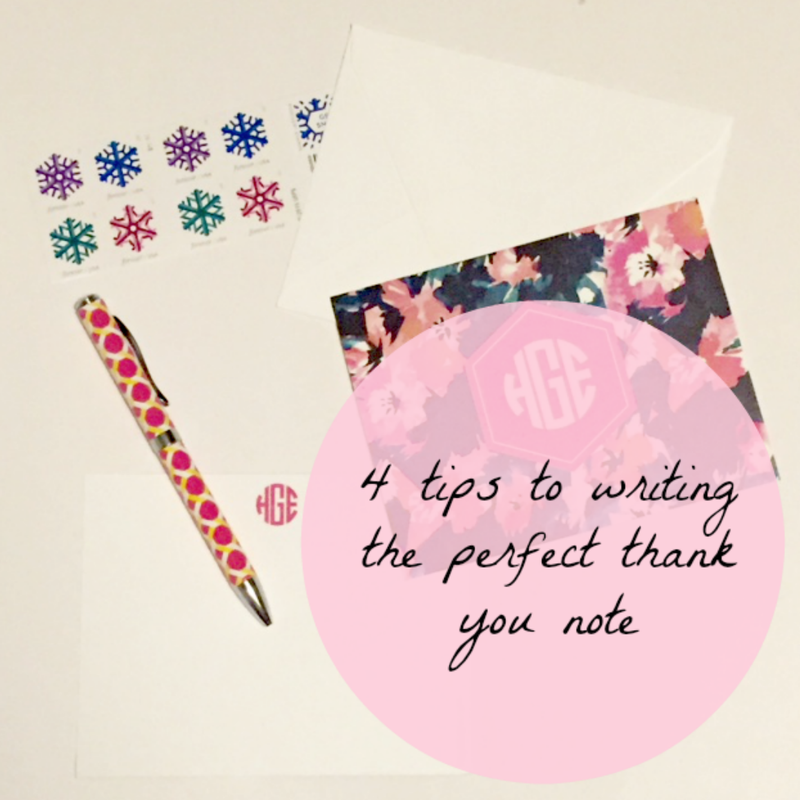 I just dropped my thank you notes in the mail from Christmas, so I thought today would be the perfect time to share my 4 tips to writing the perfect thank you notes. 1. Don't put it off - In general I give myself 30 days to write and mail thank you notes; putting it off longer than this seems rude in my opinion. After a month you've probably had the chance to use your gift, or at the very least all the stress of the occasion has calmed down. 2. Have cute stationary - I always make sure to have some cute note cards on hand for random gifts. The Target $1 section always has really cute options. I also love May Designs when I'm wanting something a little more high end. They have so many great options to personalize your stationary to really make it your own. 3. Spell check - I'll be the first to admit that spelling is not my strong skill so maybe that's why I'm so paranoid about misspelling words. I can think of very little more embarrassing than misspelling a word on my thank you notes. I always first type mine in my phone to make sure everything is spelled correctly. 4. Be sincere - I'm not a things person so expressing strong feelings for a gift is difficult for me. What's more important to me than the actual gift is the thought behind it. I focus on this when writing thank you notes. Sincerity always comes across and is appreciated; no need to say something is your favorite gift ever when it isn't. What are your tips to writing the perfect thank you note?